Deferred revenue is an advance payment received by a company. It is not yet revenues so cannot be reported on the income statement. 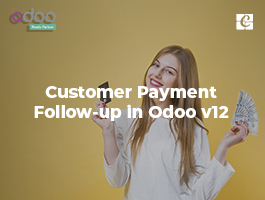 In other words, deferred revenue is a payment in advance recorded on the receipt's balance sheet as a liability account until either the services have been rendered or the products have been delivered. 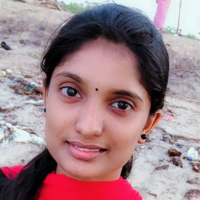 For example, if you want to sell a 1-year service contract for Rs 48,000 that begins next month and is of a duration consisting 12 months period. Once you validate the invoice, Rs 48,000 should be posted into a deferred revenue account, because the amount is what you received, and not yet been earned. And, over the next 12 months, you will be reducing the deferred revenues account by 4,000 rupees (48,000/12) on a monthly basis and recognizing the amount as revenue. 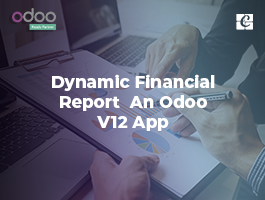 Now let’s see the Deferred Revenue Management in Odoo v12. Accounting -> Configuration -> Settings -> Automated Entries, then enable the option Deferred Revenues management. Before registering your first deferred revenue, you must define your types. 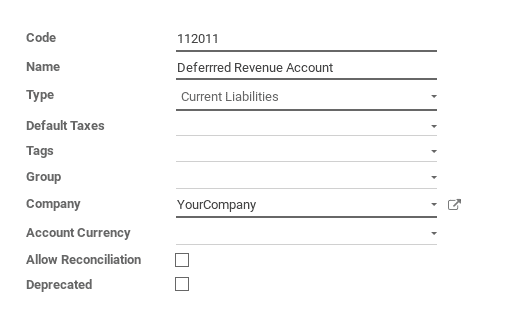 Create a new deferred revenue type by clicking the “Create” button. Example: 12 months service contract. 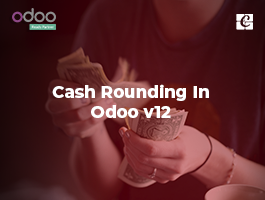 In this form, specify the type of Deferred Revenue, Company name, Journal, Deferred Revenue Account, Recognition Income Account, Recognition Account, Number of entries as 12 (representing one year) and One Entry Every as 1 month. Deferred Revenue account is a current liability account, it contains revenue that has been earned. In this form, specify the name of deferred revenue, the category selected as Service:1 year, that we previously created and set Gross Value as Rs 48,000 and Save. Upon the action, we can see that the residual value is automatically set as same as of the gross value. 1. Number of Entries: The field to input the number of deferred revenue line required to get displayed. 2. Ending Date: If selected, it displays the end date field. Provide the date you need - which deferred revenue should end in that field. Once you choose the Time Method as Number of Entries, your revenue is created, don’t forget to Confirm it. You can also click on the Compute Revenue button to check the revenue board before confirming the revenue. After that check the Revenue Board. Here you can see the deferred revenue becoming 4,000 each month. 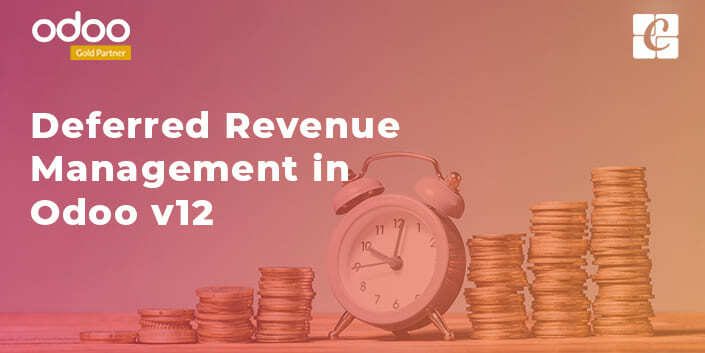 Over the 12 months, you can also see that 4,000 rupees getting deducted from the deferred revenue account and recognizing that amount as revenue. If you want to control the revenue board: by clicking on the red bullet it changes to orange bullet denoting that journal entry has been created for this line. And you can also post journal entries before the expected date via clicking on the orange bullet and forcing the creation of related revenue entry. Create Deferred Revenue Automatically from Customer Invoice. Deferred Revenue can be automatically created from a customer invoice. All you need to do is to set a deferred revenue type on your customer invoice line. When the user will validate the invoice, deferred revenue will automatically be created, using the information of the customer invoice. 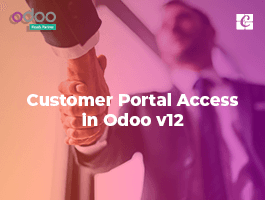 Once the customer invoice is validated, Odoo will automatically create a deferred revenue for you, and the related journal entry. How to Modify an existing revenue? 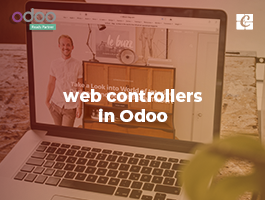 Odoo will automatically recompute a new revenue board. How to record the sale or disposal of a revenue? From the above image, you can see that 5 deferred revenue lines are posted and remaining unsent. This denotes to the fact that the journal entries have been created only for these 5 lines. If you try to sell or dispose of revenue at this stage. Click on the button Sell or Dispose. This action will post the current costs of this revenue, but it will not record the sales transaction that should be registered through a customer invoice. After selling or Disposing of the revenue, the remaining deferred revenue lines get automatically removed from the deferred revenue form and the status gets changed to Close.